Reed Sensors Market size is set to exceed USD 2 billion by 2024; according to a new research report by Global Market Insights, Inc. The global shipments are set to grow at 10.5% CAGR between 2018 and 2024. Reed sensors market size is anticipated to grow owing to the increasing demand from the consumer electronics industry for battery-operated applications. The technology is being used in several household appliances such as washing machines, coffee machines, refrigerators, dryers, and dishwaters, etc. The demand for appliances is growing owing to the increasing disposable income of people in Asia Pacific and Latin America, contributing toward the growth of the reed sensors market. The sensors are witnessing an extensive demand from HVAC applications such as air conditioners, compressors & condensers, water flow, gas smart meters, etc. Moreover, the growing use of these components for cargo theft prevention and in medical equipment has added an extra value to its portfolio. For instance, the sensors are used in canal hearing aids, driving the demand for reed sensors in the healthcare equipment. The technology enables patients to adjust the volume and program the microelectronics. Other applications of reed sensors in medical equipment include pediatric feeding tubes, pacemakers & defibrillators, dentist drill activation, spirometers, etc. The industrial controls & automation segment in the reed sensors market will witness growth to reach over USD 300 million by 2024 due to an increased demand in the industrial sector for ferrous part detection, end-position sensing in cylinders & pistons, and in transformer tap changers. They are considered as the extremophile of sensors as they work efficiently in most harsh environments and can be used from the bottom of the ocean (high pressure) to space (zero pressure) and from very cold (cryogenic temperatures) to very hot (> 200 C). Reed sensors market is witnessing a huge demand in lock systems as they consume low power and serve as a desired solution for many emerging security applications that use battery-powered devices with wireless controllers. Asia Pacific reed sensors market dominates the industry and is expected to grow in terms of unit shipment at a CAGR of 12.5%. This is attributed to the established electronic and automotive industries of Taiwan and China respectively. Shanghai and Beijing are the major regions for the manufacturing of automobiles, communication equipment, and electronics in China, augmenting the market. Government support provided to Taiwan’s electronics industry is one of the major factors augmenting demand. Growing market for smart home devices in South Korea is further contributing toward industry growth. A high demand for remote home monitoring systems is creating opportunities for the market as many manufacturers are expanding their smart home product portfolios. 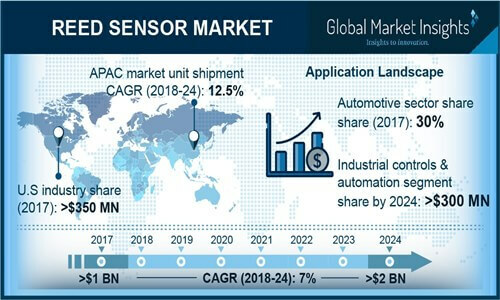 The reed sensors market landscape is highly consolidated with a few major players as manufacturing reed sensors require specialized equipment and technical expertise. Major vendors in the market space are Standex Meder, Littelfuse, HSI Sensing, Coto Technology, Nippon Aleph, and others. The gap between demand and supply for reed sensors and disruption in the production capacities of these players can have a severe impact on the global supply of these components. These companies are launching new products in the industry and are also expanding their distribution networks to cater to the growing demands across several industries. For instance, in May 2017, Reed Switch Developments Corp., a company based in the U.S. entered into a distribution agreement with Amazon.com for its magnetic reed switch sensor and actuator kits. The agreement will enable the company to strengthen its market presence in the North American market by offering its standard magnetic reed switch sensor kits to its customers for meeting the switching requirements.